Love pumpkin desserts but tired of the same old pie and bread? 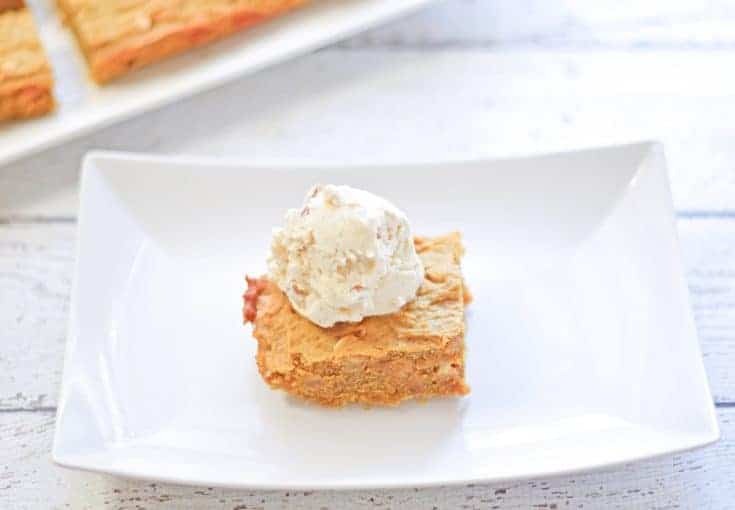 This pumpkin chocolate chip blondies recipe is so good you’ll want to make them year round. It’s that time of year when a lot of us tend to go crazy over pumpkin flavored everything. I’ll admit that with my love of baking I tend to make a lot of pumpkin pies and pumpkin bread. However, I love trying new pumpkin recipes, too. 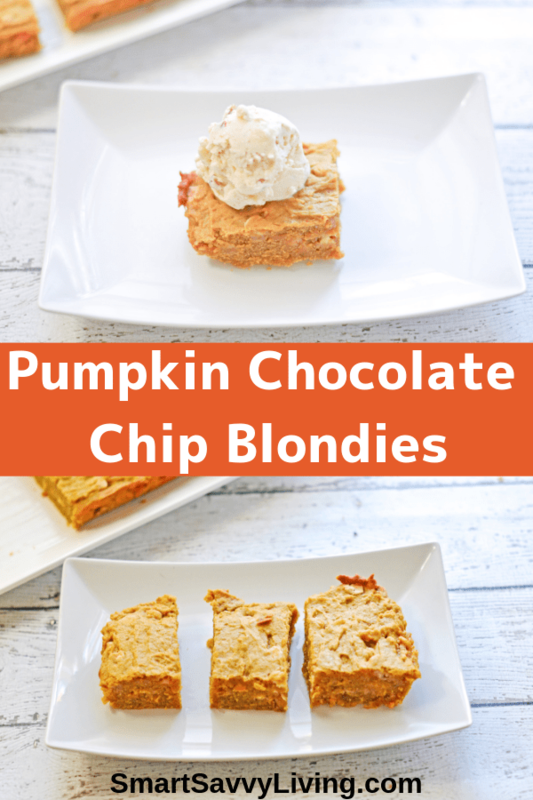 One of my favorite baked desserts just so happens to be blondies so I thought why not make a pumpkin chocolate chip blondies recipe. They turned out so good they’re definitely going in my recipe box to make again and again. You’re probably very familiar with brownies but what the heck are blondies? Well, they’re very similar to brownies. In fact, some people call them blonde brownies. The main difference is that the blondie batter itself does not include any chocolate or cocoa powder. Another difference is that a blondies recipe contain brown sugar and most traditional brownie recipes do not. Blondies also are not usually frosted, where sometimes brownies are. While brownies have that rich chocolate flavor, blondies are rich in their own way with a deep butterscotch flavor. If you make chocolate chip blondies you can expect a flavor very similar to chocolate chip cookies in bar form. 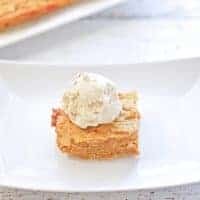 While some recipes may make a lighter more-cake like blondie, I definitely prefer the denser, chewier version that you’ll find with these pumpkin blondies. 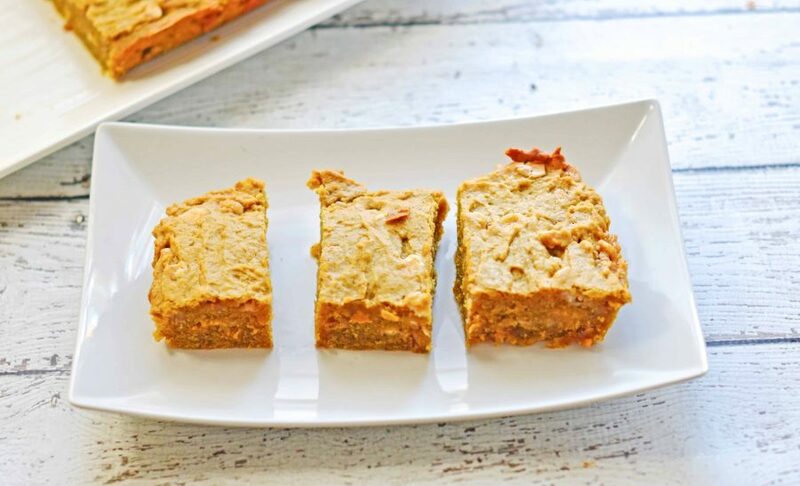 These are truly easy pumpkin blondies. All you have to do is melt some butter and the rest is just mixing ingredients together. You don’t even have to use a mixer. The hardest part is letting them cool completely before devouring them. It’s not totally terrible if you don’t. But, they will fall apart a lot more easily than if cool. Here’s my pumpkin blondies recipe with chocolate chips. These pumpkin chocolate chip blondies are perfect for when you want a pumpkin dessert that isn't the same old pie or bread. Melt butter in a small skillet over medium heat or in the microwave. Set the butter aside to cool a bit while you prepare the other ingredients. Grease a 11 x 7 baking dish, line with foil or parchment with overhang (for handles) and then grease the foil/parchment. I use non-stick spray. In a medium-sized bowl whisk together flour, cinnamon, ginger, cloves and nutmeg. Fold chocolate chips and nuts, if using, into flour mixture to coat (so they don't sink to the bottom while baking). Pour the melted butter into a large bowl and add in brown and white sugars and salt. Whisk butter mixture until smooth without lumps. Whisk in egg completely and then the vanilla and pumpkin. Fold flour mixture into wet ingredients with a spatula, making sure all flour is absorbed. Batter will be on the stiff side - spread it evenly in your prepared pan. Bake at 350° F (or 325 with a dark pan) for around 35 - 45 minutes, depending on your oven. When done, the edges should be slightly browned and a knife or toothpick inserted in the center should come out clean. Let blondies cool completely on a wire rack in the pan. Once cooled, remove with foil/parchment handles and cut into bars. Place leftovers in an air-tight container. They'll keep for about 3 days at room temperature or longer in the refrigerator. You can also bake these blondies in a 9 x 13 or square pan, though baking time will differ.